You get it. You’ve read our blogs, you’ve watched our videos, you understand the importance of whittling down your message to a clearly defined something. But did you realize that having a clearly defined message isn’t enough? Let me explain using an old metaphor: If a tree falls and no one is there to hear it, does it still make a sound? Well, the answer is… it doesn’t matter. Whether it makes a sound or not, no one will hear it. Unless you successfully market your message, it, like a lonesome spruce, is going to fall to the ground with a thud… and no one will know. What do we mean when we say marketing? 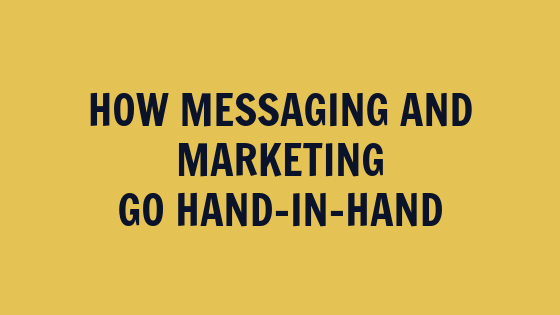 Marketing and messaging play off one another, but they’re not the same. So how do you make sure that your finely crafted message is hitting the right ears? Who is your target audience? What age/social status/gender is your typical clientele? What are their needs? Wants? Cravings? Where do they spend their time? A clear understanding of audience is critical to both messaging and marketing… for different reasons. When your message focuses on your audience, you’re speaking their language. When your marketing focuses on your audience, you’re positioning your message in the right places… so they can hear it… which leads to the second element. If your target market is teenagers and you want them to make a split-second purchasing decision, you’re not going to spend $100/month on Facebook advertising. (In case you’re lost, FB is apparently for old people. Instagram or Snapchat are better options.) Just as, if you’re targeting newly divorced women in their 40s, you wouldn’t run a bunch of TV ads around a show about finding the perfect wedding ring. Find out where your audience is gathering and meet them there. Whether that’s by posting on other blogs in your niche, volunteering to head-up the local Parent-Teacher Association, or sending out well-timed email messages when your fans are listening. Sometimes, marketing is just about getting your brand in front of people. Getting your logo in front of their eyes, getting your name in their ears, getting your message in their heads. Other times, it takes more than that. You need to make them see their need. They neeeeeed you to solve a problem, they neeeeed you to make them happy. Maybe they don’t know it yet, but you do. Once you’ve narrowed and fine-tuned your message, you can tell them exactly what it is you can do for them — including your unique, innovative spin. Yes, it’s important to talk to the right people. It’s important to meet them where they are, and to let them know why or how you can help them. But don’t stop there! Turn your efforts into conversions. Whether you are making a sale, signing up a new client, or creating a loyal fan, make sure you give your audience a way to respond. After all, you’ve done the hard work of getting them to listen to you. Get them to take action! Messaging is so important. Finding your North Star, re-evaluating your purpose, discovering what makes you unique and special. This is paramount. But a good messaging strategy and a good marketing strategy are equally necessary. They are the yin and the yang of any successful business venture. By making sure you have equal parts messaging and marketing, you’re going to present a greater version of yourself and your business to the world than what you could do with just one or the other. Well, you have options. All kinds of options, in fact. It’s true that it can get overwhelming, and we certainly aren’t advocating overwhelm. But what we are advocating is a plan, just as we encourage you to have a messaging strategy before you start putting out, well, messages. First, make sure you’re confident in your messaging. If you’re not, download our free messaging assessment here. Then, figure out where your messages are going to go. Start with one or two marketing channels and see how it goes. You’re not making a lifetime commitment here… you’re always free to backtrack, or even to pull the plug if something isn’t working. We do suggest, as with our other recommendations, that you try something for at least 90 days. This is a long enough time to get a feel for whether or not your marketing efforts are working for you. If nothing else, you will have some ideas as to the potential effectiveness of your advertising and marketing efforts. Once you’re confident in the “you” you are presenting to the world, then our only remaining piece of advice is this: JUST DO IT. Yes, we stole that from Nike, but seriously — sometimes, you just have to fall forward. Even if you’re nervous, even if you’re not totally sure it’s going to be a success, even if you have no idea what your ROI will be… YOU are worth it. And so you move forward. You try something. You jump. And if it’s a flop – well, at least you weren’t still standing in the same place for months at a time, paralyzed by the unknown. No one can accuse you of being stuck! You are making forward motion. Not that we are encouraging you to fail, but we want to remind you that even if you do find yourself facedown with a mouth full of sand, you can always get back up. As Henry Ford indicates, you can always begin again, and with more wisdom the second time around. We have clients all the time who, as time passes, tweak their message to make sure it’s still relevant. (In fact, we strongly recommend this!) And then, having redefined their message, they must therefore re-evaluate their marketing. Whatever happens, just don’t focus on the one without remembering the other. Again, as you adjust your message, don’t forget to adjust your marketing. As you try different marketing channels and learn which ones bring the best results, don’t let your message sit on the shelf in some dark closet of business has-beens. Remember, messaging + marketing = HAPPY COUPLE! And… happy couples? Well, they walk hand-in-hand. If you’re not sure your marketing strategy is quite up to par, schedule a call. We’re all about helping you get the right message to the right audience.